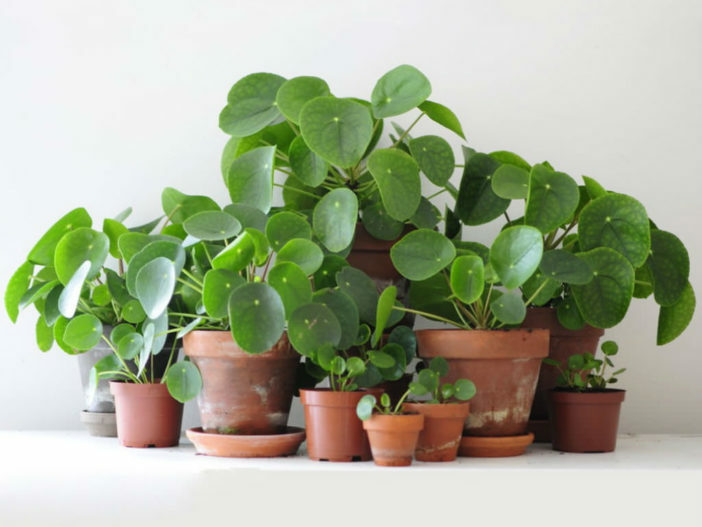 Pilea peperomioides has become the houseplant on everyone’s wish list. It is native to southern China and it hasn’t been a houseplant for very long. In the 1940s, the plant was brought to Norway by a Norwegian missionary Agnar Espegren who was living in China. The plant slowly spread through people sharing its “pups”. The plant’s bright green color contrasts wonderfully against white walls, which is perhaps why it’s so highly sought after in the minimalist interior design world. Also called Chinese Money Plant or Pancake Plant due to its flat, coin-shaped foliage, it has a central upright stem, surrounded on all sides by its characteristic perky peltate leaves. The flowers are very small, whitish or pale green, sometimes tinged pink and appear in spring on pinkish stems. It has gained the Royal Horticultural Society’s Award of Garden Merit. Chinese Money Plant likes bright indirect light. This plant is a relatively fast grower during the growing season from spring to fall. It should be rotated regularly to keep the main stem growing upright because the plant will turn all of its leaves towards the light. Use a well draining potting soil and repot it when the roots are coming out of the bottom of the pot. Water moderately during the warmer months and wait until the soil is mostly dry between waterings. If the lower leaves start to turn yellow and falling that’s a sign of overwatering. Use half diluted all-purpose houseplant fertilizer once a month during the growing season. If you notice white spots on your Chinese Money Plant, they are most likely caused by salts and chemicals in your water. If you do not have a filtration system, leaving the tap water in an open container overnight before watering can help remove some of the chlorine and fluoride. This plant is very easy to propagate because it puts out baby plants through the soil. When it becomes a well-established plantlet, you can separate it from the mother plant with a clean, sharp knife and put it into moist soil (and keep the soil moist until it starts to grow new leaves) or into water for root development.